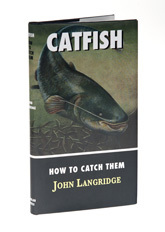 Another new entrant in Medlar's contribution to the much-loved How to Catch Them series, John Langridge's Catfish fills an important gap in the ranks of these classic little books. The reason catfish didn't make it into the original series is simple enough: the species doesn't naturally occur in Britain, but experience in Europe led to the introduction of Siluris glanis into hundreds of lakes during the nineties, with the result that cat fishing has an enthusiastic following nowadays. Amazing to relate, the first introduction of catfish into UK waters took place as long ago as the 1880s, but catching them on the derrick-like tackle that was available in those days never really appealed and it has been the improvements in modern gear that have created the catfish sport fishery. John's book follows the pattern of all the How to Catch Them books by distilling everything you need to know into less than a hundred pages, beginning with a look at the fish and its habits, before moving on to discuss venues, tackle and tactics. Although catfish can be caught in the UK, most of the best fishing is across the channel, so John considers southern European as well as British fishing and there is a section of monochrome plates. More information on the subject can be found in the author's Complete Book of Giant Catfish, but this attractive little volume makes a perfect introduction to the species and the fascinating subject of catfishing.